The shops in Coachford offer so much to those who are willing to shop there. Now as we face the run up to Christmas it is important to consider doing at least some of your shopping in the village. 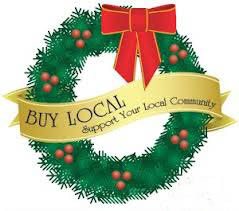 We can all buy some of our gifts from the many wonderful shops including our Hardware Stores, Pharmacy and Supermarkets. Our food stores and artisan producers are second to none. Our shops have extremely competitive prices for everything you need for Christmas. If you are making a big purchase like a Laptop or a Tablet why not source it locally? We should also make an effort to celebrate the season in the local pubs and meet up with our friends and neighbours locally. The businesses have put in a huge effort to prepare for Christmas and we must support them and those that they employ. Everyone should use our local Post Office to send their Christmas cards and parcels, use our local taxis and hackneys, think about gift vouchers from all the business’s such as the Pharmacy, Hairdressers, Beauty Salon, Post Office, Garage and Filling Station and give some serious thought to shopping in Coachford. Our local businesses support other local businesses, They employ people from the locality and give something back to the community in their support of local charities, organisations , schools and clubs.